Write code so that if user clicks a button, the value of one text input is duplicated and assigned as the value of other such inputs. 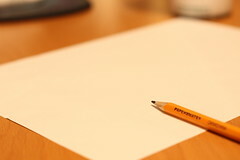 Without using a computer, see what you can devise using only pencil and paper. The problem itself is seemingly a purely academic exercise without any real-world application. Or, is it? Suppose you needed the user for some reason to set inputs to a default value of his/her choice, you may find one of the following snippets useful. To knock out the HTML, the example below uses HTML5 as it is rapidly becoming the new default standard for web pages. In an actual test situation, you may prefer to write your code with XHTML instead since there are employers are who still resistant to HTML5. You may observe that I have not included code for the form_styling.css file. I leave that to you to determine how you want your form to look. The above code should work, causing the two specified inputs to acquire the value of the first one. But is this good coding style, let alone excellent? Notice that document.getElementById is used probably more than is necessary, so this approach is merely adequate at best. This example embodies an actual programming solution. Notice that instead of an assignment statement, I use an element’s setAttribute method. Each input value is set programmatically which makes the code more robust than the previous solution. This code is also more efficient since it uses document.getElementById about half as much as in the first example. Yet, there is a flaw. The code relies on the old-fashioned form elements collection (see http://www.w3schools.com/jsref/coll_form_elements.asp) which is apparently an historic best practice rather than a current one (see http://stackoverflow.com/questions/2435525/best-practice-access-form-elements-by-html-id-or-name-attribute). Another issue involves referring to the first input with numeric indexing which can be problematic, especially if one decides to add another input and change the order so that the new one is first. The following example is similar to the previous one. The only real difference is that I use HTML DOM to access all the inputs with document.getElementsByTagName. I also use the item property of each input in making changes. After collecting all the inputs, the code loops through them and assigns the value of the first input to all of them, even itself! The following is a variation of the above solution. The code also makes use of the form’s firstChild property and uses array indices instead of item which may aid legibility. Lastly using an assignment statement to set a value is faster than repeatedly using the method setAttribute as done in a previous example. Note how the jQuery script in this example compensates for XHTML lacking an autofocus attribute by chaining the first input’s focus and select methods. The val() is quite clever. Without a parameter, it will extract a value and with a parameter, it sets an element’s value. Lastly, observe how all the input text values are set by the one-liner in line 5. If you try out the HTML5 code above, you may find that it may work only partially depending on the browser. For example, the placeholder text works in FireFox 5 but not Safari 5.0.4 on a windows desktop running XP, service pack 3. Remember, HTML5 is still an evolving standard! This blog is devoted to sundry web development topics, whether front or back-end related, with an emphasis on PHP.